This year Valentine Day falls on a Saturday and so we imagine that there are going to be loads of Valentine Themed Weddings. And why not? Some may say its cheesy, but imagine the fun to be had! Colour wise, it's got to be red and pink - flowers, dresses, table decoration, cake and pink or red lighting - as shown in the picture of the Criterion. 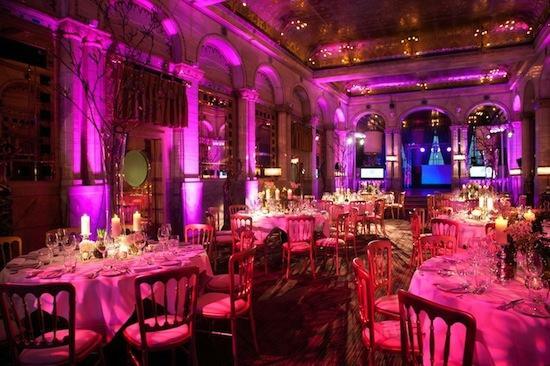 It is one of our most stunning venues - history, opulence, glamour and in the heart (get it?!) of London. Look at the lighting at the Langham in this picture - all it needs is some red centre pieces on the tables, red table cloths, pink fizz - like the image below. Elizabeth Bennet, Jane Eyre and Mr Rochester, Napoleon and Josephine, Antony and Cleopatra….. The grand Gothic Revival style hall with its hammerbeam roof effect is approached via an impressive ceremonial staircase. This room is the largest in the Town Hall and can accommodate 450 guests theatre style or 250 guests seated at round tables. With a sprung wooden floor and atmospheric lighting, it could be the perfect place to hold a Valentine Wedding Ball!